The latest Windows Azure Services for Windows Server preview enables cloud hosting providers to offer multi-tenant Windows Azure IaaS subscriptions. of Windows Azure Services for Windows Server. The move enables cloud hosting service providers to offer customers subscriptions to multi-tenant Windows Azure VMs and high-density websites with SQL Server or MySQL databases from a private cloud. Whether enterprise IT can pass down this or similar self-service provisioning features to end users is the question. The Windows Azure Services for Windows Server (WAS4WS) technical preview (TP) for Hosting Service Providers (HSP) provides only Windows Azure Infrastructure as a Service (IaaS) core services for a private cloud -- stateful virtual machines (VMs) and websites with persistent storage and optional SQL Server or MySQL back ends. Figure 1. The portal's sign-up form lets potential tenants choose a subscription type, such as Cloud Basics, and provide credentials for managing user accounts. 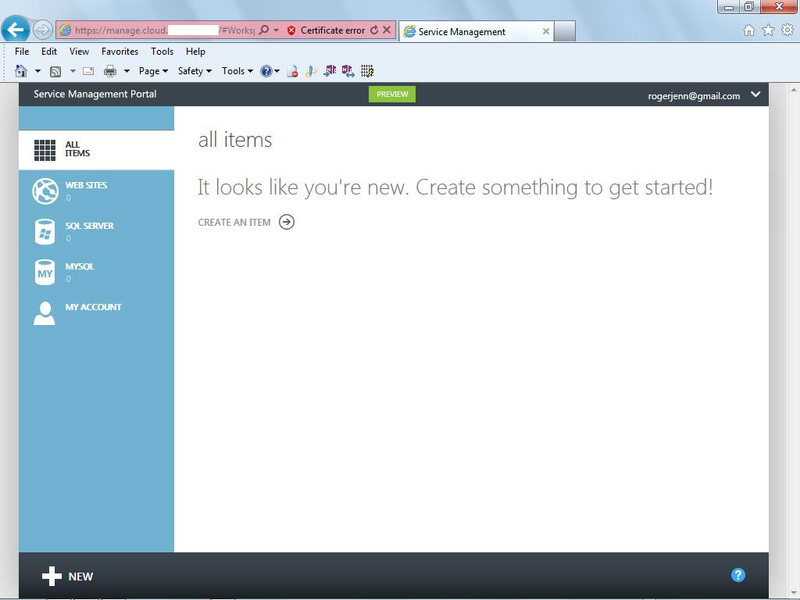 As a customizable hosting-specific version of the new Modern UI Style (formerly Metro), the Windows Azure Management Portal allows admins to set up multiple subscription plans with varying limits on the number and size of Windows Azure Virtual Machines (WAVMs), Windows Azure Web Sites (WAWS) and SQL Server or MySQL databases (Figure 1). The portal takes advantage of a full-featured, RESTful management API. WAS4WS offers the same choice of Web apps and programming languages as the Microsoft-hosted WAWS. When trying to understand what WAS4WS is, it's important to first look at what it isn’t. For one, it's not the elusive Windows Azure Platform Appliance (WAPA) that Microsoft announced at its Worldwide Partners Conference in 2010. WAPA was intended to enable selected partners -- initially Dell, HP, eBay and Fujitsu -- to duplicate Windows Azure features in their own or their customers' data centers. Currently, Fujitsu is the only third-party provider running WAPA in a non-Microsoft data center. WAS4WS doesn't include Windows Azure Storage services, nor does it deploy the Windows Azure fabric to implement high-availability features with data replication. Tenants will need to add Web Worker instances to ensure availability, and scale-out for traffic surges. The closest public cloud equivalent of WAS4WS (other than WAVMs) is the Amazon Virtual Private Cloud (VPC) with Windows Server 2008 R2 images. Neither Amazon nor Google offers a private cloud version of their public cloud services, but Eucalyptus Systems has an agreement with Amazon Web Services (AWS) that enables users to migrate workloads between existing data centers and AWS while using the same management tools and skills across both environments. Figure 2. WAS4WS' Service Management Portal and API orchestrate Microsoft Systems Center 2012. So, what is WAS4WS really? And what are its main features? The Windows Server team's Getting Started Guide includes a basic system diagram for the Windows Azure Services for Windows Server Technical Preview (Figure 2). Web workers: A Web Sites-specific version of IIS Web server that processes clients' Web requests. Load balancer(s): An IIS Web server with a Web Sites-specific version of application request routing that accepts Web requests from clients, routes requests to Web workers and returns responses to clients. Publisher: The public version of WebDeploy and a Web Sites-specific version of an FTP that provides transparent content publishing for WebMatrix, Visual Studio and FTP clients. Management Service -- Admin Site: Where administrators can create Web Site clouds, author plans and manage user subscriptions. Management Service -- Tenant Site: Where users can sign up and create Web Sites, virtual machines (VMs) and databases. Web Farm Framework to provision and manage server roles. Resource Metering service to monitor Web servers and site resource usage. According to the guide, a future technical preview will support public DNS mapping; the current TP handles only a single domain with DNS A records. The Technical Preview is intended to run on a single Hyper-V host with seven virtual machines. In addition to the virtual machines required for the software, it is expected that there will be a separate server (or servers) in the data center running Microsoft SQL Server, MySQL Server, and a File Server (Windows UNC) or NAS device hosting web content. First Volume: 40GB or greater (host OS). Second Volume: 100GB or greater (VHDs). Separate SQL server(s) for Web Sites configuration databases and users/web sites databases running Microsoft SQL Server 2008 R2. 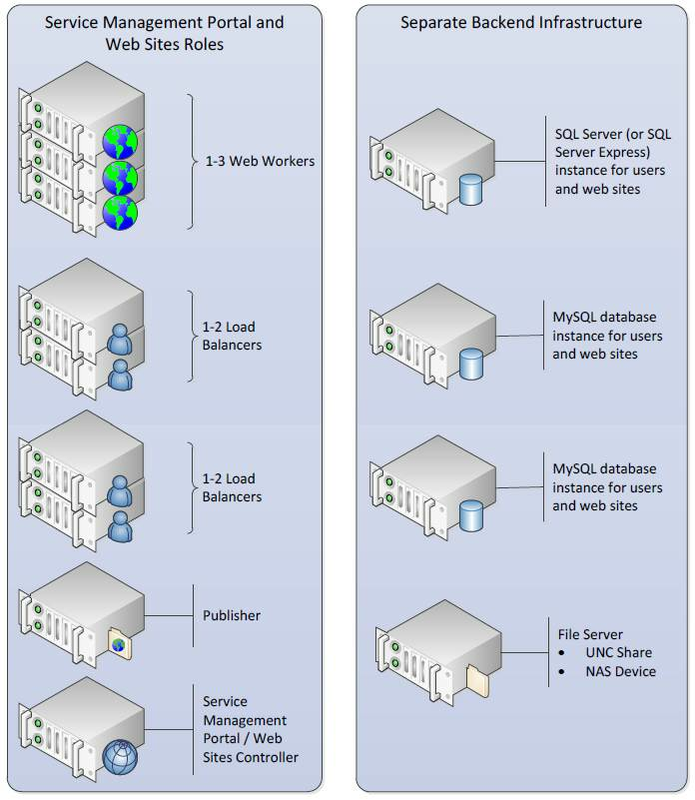 Separate MySQL server version 5.1 for users/web sites databases. Either a Windows UNC share or a NAS device acting as a File server to host web site content. The SQL Server, MySQL Server, and File Server can coexist with each other, and the Hyper-V host machine, but should not be installed in the same VMs as other Web Sites roles. Use separate SQL Server computers, or separate SQL instances, on the same SQL Server computer to isolate the Web Sites configuration databases from user/web sites databases. My primary development PC has an Intel DQ45CB motherboard with a Core Duo Quad 2.83 GHz CPU and a maximum 8 GB of RAM. I enabled the Hyper-V role on Windows 2012 Server RC to act as the host VM and created an initial VM for the Service Management Portal and Web Sites Controller with 4 GB of RAM. I then downloaded and expanded 21 System Center 2012 SP1 CTP2 VHD archive pieces, which was 14.5 GB, from here, added a default SQL Server instance, downloaded and installed the System Center 2012 SP1 CTP2 -- Service Provider Foundation Update for Service Management API (SPF, 8.6 MB), and ran the ManagementServiceSingleMachineInstallation.3f.3f.3fnew.exe Web Program Installer (WebPI). Figure 3. 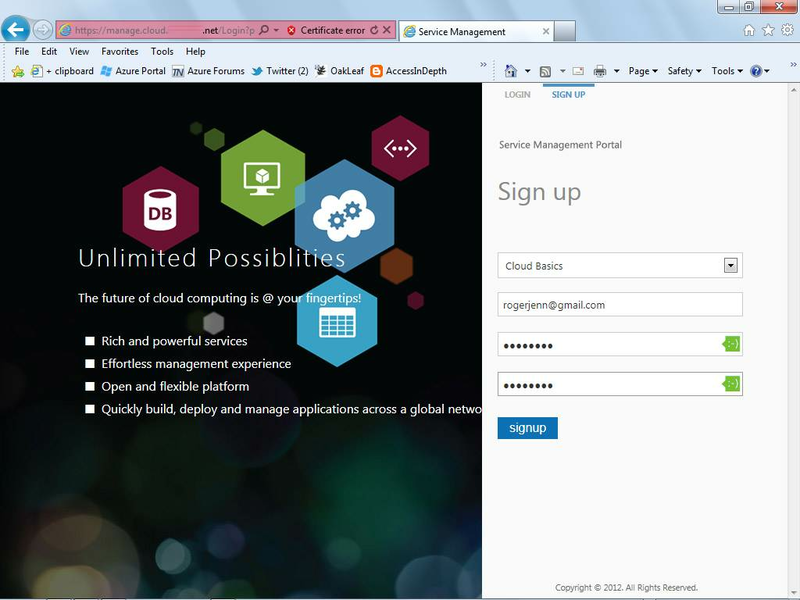 The Administrative Portal lets you configure a Web Site Cloud, VM Clouds, SQL and MySQL Servers. 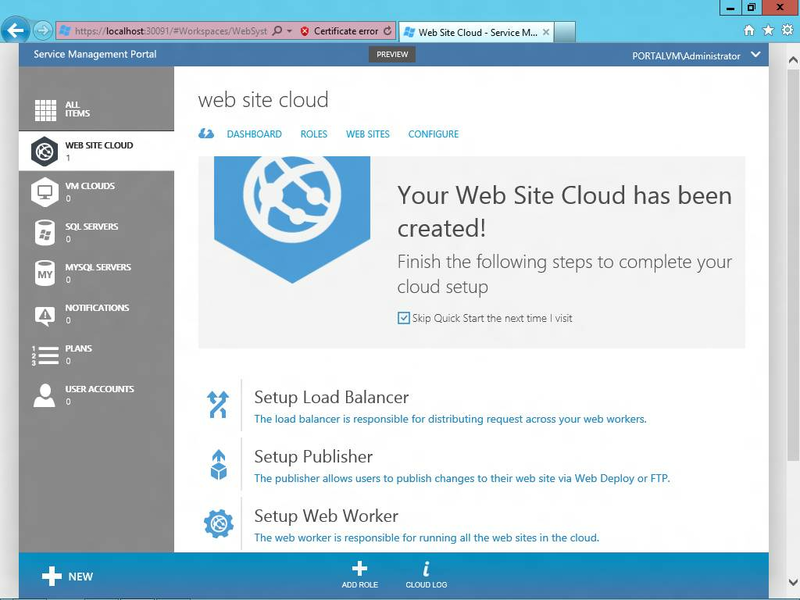 My blog post on configuring Windows Azure for Windows Server gives fully illustrated details. Once the configuration is complete, visit the Administrative Portal to see details of value to prospective hosters and enterprise cloud adopters (Figure 3). Tenants logging in after initial configuration can create new websites, SQL or MySQL server instances (Figure 4). If the plan includes a VM cloud, they can create Windows Server 2008 R2 SP1 or 2012 instances. Figure 4. Tenants with plans that don’t include VM instances can create websites using SQL Server or MySQL back ends in a virtual duplicate of the new HTML-based portal for Windows Azure Platform as a Service resources. Finally, the Administrative Portal Resource Metering service simplifies chargeback to business units based on their resource consumption. It's free to test-drive the WAS4WS TP and only requires that you accept an end-user licensing agreement . You will need to execute a Services Provider License Agreement (SPLA) for WAS4WS' release version. The SPLA doesn't include startup costs or long-term commitments; it requires monthly payment in arrears for Microsoft software that tenants use. The hitch is that the SPLA Qualification Roadmap indicates that if the software is being used only by employees, contractors, affiliates or agents of the licensee, conventional internal licensing programs apply. One question I received yesterday after my presentation was how enterprise customers should think about this release and whether it's something they should adopt as well. This is a great question and one on which I wanted to provide a little more clarity. This release was specifically designed to benefit service providers and not the typical enterprise customer. Hosting service providers will use these technologies to provide out-of-the-box web site and Infrastructure as a Service (IaaS) offerings to their breadth customer community. For enterprise customers, the right solution for a dynamic datacenter and private cloud environment is Windows Server plus System Center. Here you'll find all the capabilities needed to aggregate resources and delegate them within the organization to allow for self-service provisioning and management of your VMs and applications, whether in your datacenter or through a Windows Azure subscription. Plus, with the upcoming Service Pack 1 release of System Center 2012, we'll enable customers to see and utilize capacity they've provisioned from service providers in the very same way as they consume their own resources or those in Windows Azure. It's understandable that Microsoft's Server and Tools Business doesn't want to sacrifice current licensing revenue by enabling enterprises to pay-as-you-go on a monthly basis using an SPLA. Regardless, Microsoft should provide the Service Management Portal and API as a package to enterprises that require more granular deployment and chargeback features than those offered out of the box by Windows Server and Systems Center 2012 with App Controller. IT admins can make a case for these features in the Web Sites and Virtual Machines on Windows Server for Hosting Service Providers forum.